Back in March, Lindsay Nixon (aka The Happy Herbivore) stopped by and answered some questions for me during her blog tour for her first cookbook, The Happy Herbivore. 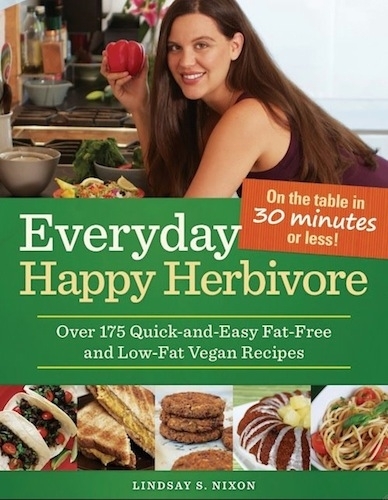 I am happy to announce that she is back, answering some questions about her newest cookbook Everyday Happy Herbivore, which I know is on a lot of your Christmas lists! Q1: What was your inspiration for writing Everyday Happy Herbivore? I started my blog (and now write cookbooks) with one mission: to show that eating healthy, plant-based meals is easy, approachable, affordable and most importantly — delicious. I’m proving that healthy doesn’t have to be expensive or complicated or a chore. It’s possible — and fun! Everyday Happy Herbivore is just an extension on that. I was living on a small island in the Caribbean where I had to make three meals a day from scratch — I developed a sort of “quick and easy” back to the basics approach, which lead to the second book. My recipes are all no fuss, everyday ingredients, quick and easy. Q2: How is this cookbook different from your first cookbook, The Happy Herbivore? They both focus on wholesome “everyday” ingredients, low fat recipes… a no fuss cooking style, but Everyday has more vareity. For example, I have smoothies in Everyday (something you won’t find in the first book). I also pulled in a lot of international inspiration. You’ll find recipes with Cajun flavors, Thai, African, Indian, Italian and so many more. My first cookbook has a lot of “comfort foods” and I’m sort of going back to basics with Everyday — focusing on fresh ingredients, celebrating vegetables and legumes rather than remaking an old family favorite like I did with the first book. Q3: Is writing your second cookbook easier or harder than your first? With the first cookbook, I had a lot of recipes already written that had been on my blog, and I was able to recycle some of them and just build on that when writing the cookbook… but with my second book I had nothing on stand by. I had to write the whole book in a few months which was a challenge, but I enjoyed it. There is also the pressure to live up to the first book! Q4: Do you have a favorite recipe from this book? Q5: Any plans to write more cookbooks in the future? I am writing my third cookbook now. Sarah says: Yay! I know we are all excited about that! Thanks, Lindsay, for answering my questions and also for sharing this delicious recipe with me and my readers. I can’t wait to make this one! Preheat oven to 350F. Fill muffin tin with paper liners and set aside. 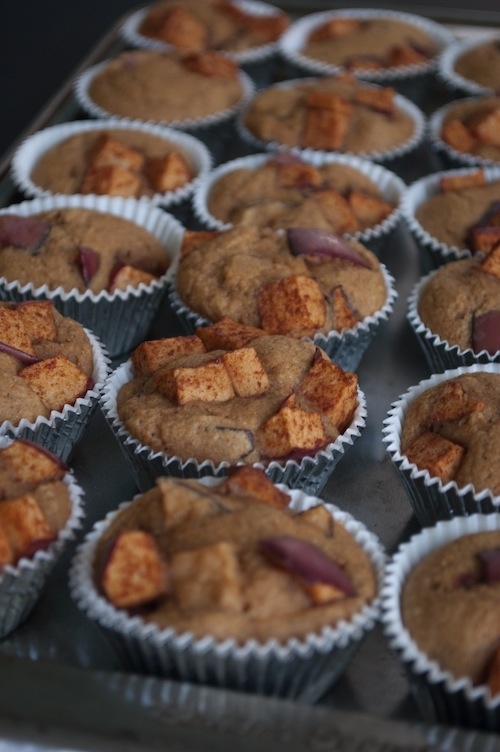 Toss 1 cup apples with a few dashes of cinnamon and a little brown sugar until well coated and set asides (“topping”). 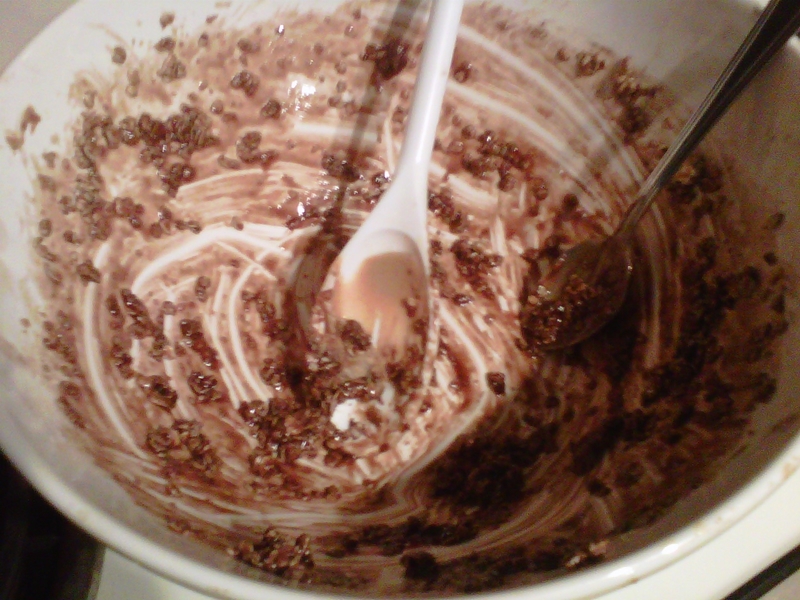 In a small bowl, whisk nondairy milk with vinegar and set aside. In a large bowl, whisk flour, salt, baking powder, baking soda, ½ to ¾ tsp cinnamon (your choice) plus a dash of nutmeg or ginger, and stir to combine. Whisk in sugar then pour in milk mixture. Add vanilla and remaining ½ cup apples and stir to combine. Spoon into muffin cups just a tad more than ½-way full. Add “topping” on each. Bake 15-25 minutes, until a toothpick inserted in the center comes out clean. Meanwhile, make glaze, substituting 1 tsp of liquid with 1 tsp pure maple syrup (optional). Drizzle warm fritters with glaze. Tip: Once the fritters completely cool, the liners will peel off. If you plan to eat them warm, lightly spray the inside of the liner with oil-spray to prevent sticking or forgo the liners and grease your muffin tin or use a nonstick pan. After vegan chef Lindsay S. Nixon wrapped up her popular cookbook The Happy Herbivore Cookbook last year, she went back to her kitchen in her new home of St. Maarten. Island living encouraged Nixon to come up with simpler fare, which led to a follow-up cookbook focusing on recipes that bring tasty back to quick-and-easy. Now, in Nixon’s much-anticipated follow-up cookbook, Everyday Happy Herbivore, readers will see, once again, that just because plant-based eating is optimal for health, it doesn’t have to also be expensive or time-consuming. Everyday Happy Herbivore includes more than 175 doable recipes–recipes that are so quick and easy, you could cook three healthy meals from scratch every day like Nixon does. Each of Nixon’s recipes are made with wholesome, easy-to-find, fresh ingredients and include no added fats. With additional notes indicating recipes that are ideal for preparing ahead of time and those you can whip up with just a few dollars, Everyday Happy Herbivore will be the must-have cookbook for anyone desiring a healthier, happier menu! I can’t believe it’s already December 1st! I think I say this to myself every time we enter a new month. Mostly, I can’t believe that 2011 is coming to an end. It’s been an interesting year, but I feel like I’m ending it on a high note and I feel very blessed. Anyway, a month ago today I posted my November goals. I’m glad I only set a few because it ended up being another busy month, but let’s see how I did. Get at least one more room of our house “finished” – Um, sort of? I did put a lot of stuff away when I thought someone was coming to clean our house (remind me not to buy anymore Groupons for cleaning companies) and I’ve also gotten a good start on Christmas decorating. Nothing is really ever “finished” right? Send out some handwritten cards – YES! I sent out the two cards I mentioned last time and I’ve also been trying to send encouraging messages to people on Facebook and via text. It’s been good and people really seem to appreciate it. Bake, bake, bake – I have taken this one to a whole new level. I’ve baked desserts, enchiladas, vegan meatloaf for Thanksgiving, cinnamon rolls from scratch (first time ever), and a lot more that I’m sure I’m leaving out (plus some no bake things too). Very happy with this one and want to continue. Homemade Christmas presents – I’m working on this one too. I didn’t get started until the week of Thanksgiving but I’ve already got one gift nearly finished and just a few more to do before December 25th, let’s hope I can buckle down! Rest – I haven’t taken a nap in a few weeks so I definitely need to get on this. I also didn’t do enough fun shopping/browsing but hopefully I can find some small local shops to visit this month (no malls or Target for me this time of year, too much stress). But I have been spending more time at home during the week and I’m learning to say no to things from time to time when I just don’t have the energy to be somewhere. So, in review, even though they each required a little explanation, I would say I was fairly successful at meeting my goals for November. I could have done better but at least I made some intentions and followed through on all of them to some extent. Stay active during the holidays – The colder it gets outside, the harder it is for me to stay motivated to go out, get in the car and go to the gym. It’s easy when I’m at work because the gym is here, but we get a little over a week off after Christmas and being away from work (hence, off my normal “schedule”) can make staying active more difficult. But I have plenty of options to use over the break, including a temporary membership to the YMCA and a Groupon for Zumba/Yoga classes, so no excuses. Staying active to me means getting in some sort of movement outside of your normal daily activities at least a few days a week and resting when you need to as well (it’s important to recognize resting needs vs. wants, ha ha). Keep up with reading/listening – I see a theme here. Keeping up with the things I’m already doing now while I’m off work. In the past few months I have discovered audio books and it helped me reach my goal of reading 12 books in 2011, I’m actually on #13 right now. I buy them at a used bookstore and then sell them back to buy more, but I also live down the street from a public library, so I need to utilize that more. This will be easy to do for most of the month but I think this one will be challenging at home because I won’t be at my desk with headphones on able to listen. Perhaps I will be able to read a “real” book that week! Ha ha. Maybe that’s the real goal here, read one “paper” book. If you are interested in what I read or want to swap book ideas, find me on Goodreads. I have decided to up my goal to 24 books in 2012, eek! Send Christmas cards – This is something I haven’t done in years, believe it or not. I just sort of got out of the habit and now that we know so many people I was always afraid that we wouldn’t be able to do one for everybody and then someone would get offended and so on. Another one of my goals for 2012 is to care less about what people think or at least don’t invent what I think people will think because I’m probably wrong anyway. But I plan to send a few or some, as many as I can and to write thoughtful messages in them and not just sign my name to a stack of cards (not that there’s anything wrong with that, ha ha). See November’s goals – I want to keep up with what I started last month. They were all good goals that I believe can apply all year long. So what about you? 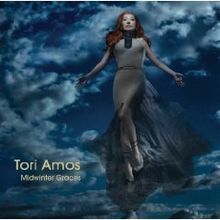 What do you want to accomplish in December and the final month of 2011? Even though I have been eating a vegan diet for more than 2 years now, there are still some old favorite dishes and other food items that I have yet to replicate minus the meat, eggs and dairy. 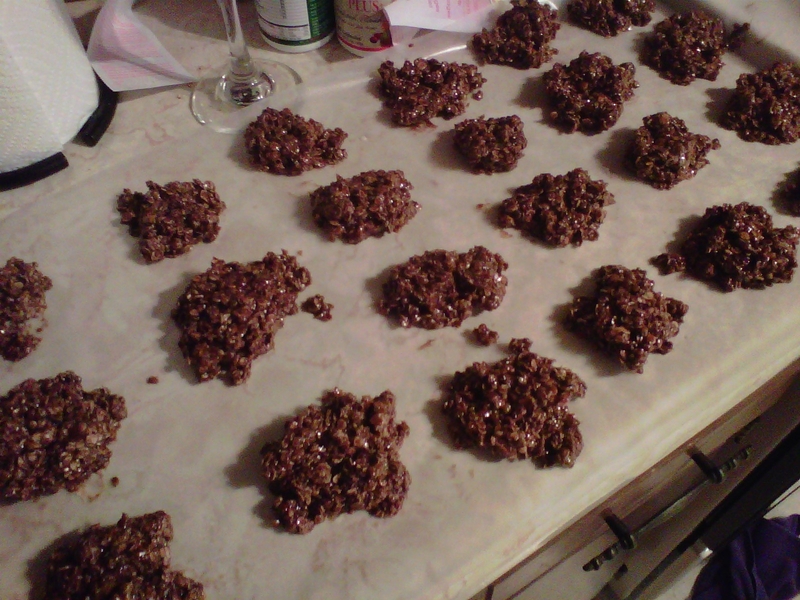 One of those is no bake cookies. You know, the yummy ones that show up at just about every holiday party? I haven’t had them in years and honestly hadn’t even thought about them much. Then we had plans Monday night to visit a friends’ house and we needed to bring a snack. For some reason they popped into my head and I went straight to the internet to find a recipe that contained ingredients I already had on hand at home. Success! I don’t know why I didn’t think of this sooner! I also wish I had thought to start taking pictures sooner. 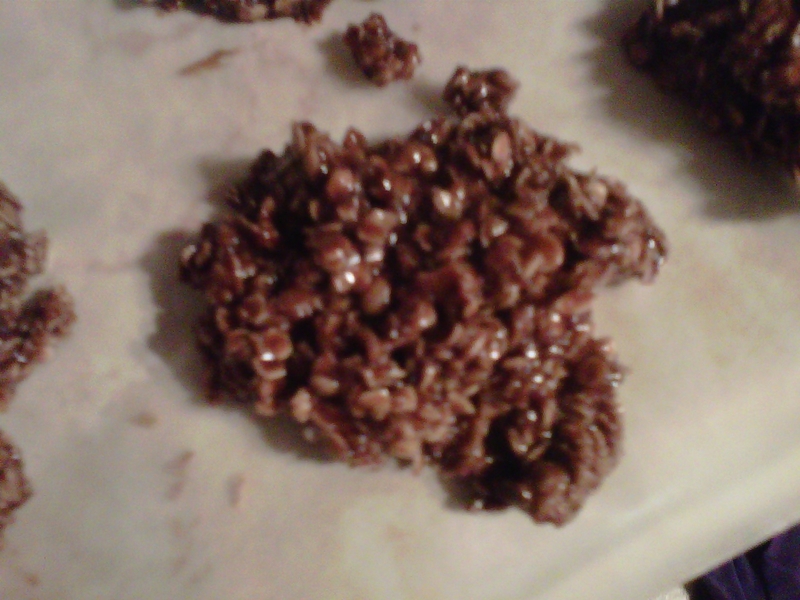 I found this recipe for Chocolate Peanut Butter no bake cookies on the Peta website thanks to Google! It was the first one that popped up when I searched for “vegan no bake cookies” so I went with it. I followed the directions and ingredients exactly so you’ll have to click the link if you want to try it yourself 🙂 But I promise, they are delicious! I had a bunch of random ingredients at home that I wanted to use up, plus I was making enchiladas for some friends of ours who just had a baby, so I bought some tortillas and a few other ingredients that I was missing. I based my enchiladas on this recipe from Allrecipes.com. I find it to be a great site because the recipes are simple and easy to adapt to whatever ingredients you have on hand or whatever your dietary preferences are. I made enough adjustments and substitutions that I feel like I can safely post my version of the recipe here. Cook chopped onion in olive oil over medium heat (use a few cloves of garlic too if you’d like, I couldn’t get my jar open!) until soft, then add chickpeas, tomatoes, picante sauce and spices. Reduce heat, simmer and stir until thickened. Add rice and let cook a few more minutes, stirring occasionally. Spray a 9×13 (or whatever size you want to use) pan with cooking spray. Add a couple spoonfuls of chickpea-rice-veggie mixture into each tortilla and roll. Place wrapped tortilla seam side down in the dish. 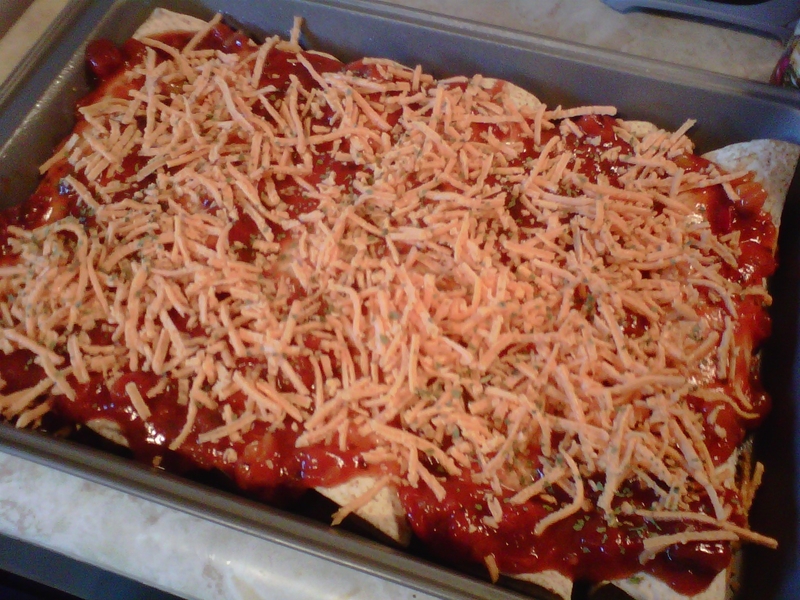 Once you place however many fit in your pan (6 fit in my 9×13 pan and I had some leftover filling so I could have made maybe 4 more) pour salsa on top and sprinkle Daiya cheese and ground cilantro on top as desired. Here’s what it looked like before going into the oven! I can’t believe I actually have a food post to share with you guys. It’s a rarity these days, I know. I have just been waiting to be inspired. I’m glad it happened! 1 package of Trader Joe’s Soy Chorizo (aka vegan spicy faux sausage) – $1.99 by the way! 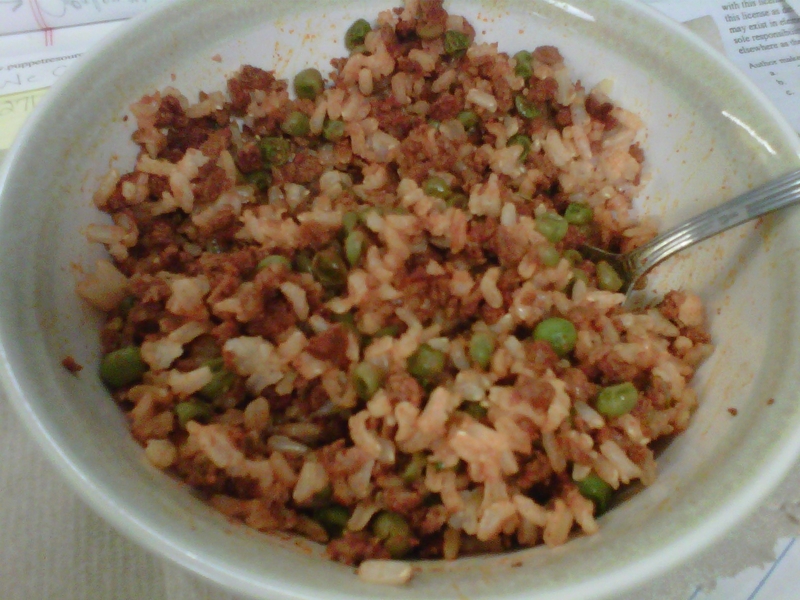 It’s also not the most attractive thing but it’s tasty (spicy! ), cheap and filling! I can’t put a price on the brown rice really since I just used a cup dry and I buy a huge bag that lasts me forever. But based on the other two ingredients, I’m guessing this meal would only cost $1-2/per serving. I used cereal bowls but they were piled pretty high! The above picture was taken about 2/3 of the way through lunch today, when I had the bright idea to blog about this new “recipe” of mine. Confession: I am one of those people that thinks you are crazy for dragging out your Christmas decorations right after Halloween. 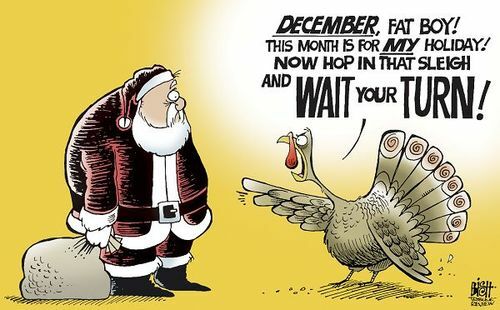 I roll my eyes when I hear Christmas music playing at some stores before Thanksgiving has even had a chance to make an appearance. However, I might just get it now. It’s not just a time of year between Thanksgiving and January. It’s a season. It’s a feeling. It doesn’t matter whether you only feel it from December 1-25, or if you start feeling it in October when the leaves start changing, or you feel it all year long. Retail and other craziness aside, it can be a truly wonderful time of year. What do I have to thank for this? I got visited by three ghosts. Ha, just kidding, obviously! 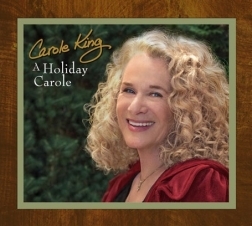 But I did get visited by some new holiday music. That’s all it took! I still don’t like that music they play at the mall. If I have to hear one more version of “Rudolph” I think I might scream. 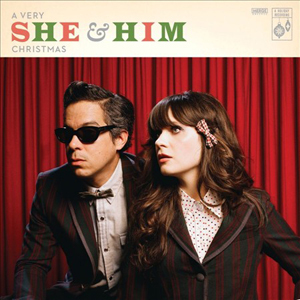 But a few artists I really enjoy outside of holiday music have put out holiday music albums recently that have suited me better. If you aren’t a lover of the traditional or commercial holiday songs and you like any of the above artists, I highly recommend these albums. Okay, seriously, who am I? Can you believe it’s already November 1st? That means in two months, it will be 2012! Crazy, right? Even though yesterday was Halloween, I was still surprised to see the word November showing up everywhere this morning: on my phone, computer, tv, etc. It just seems like the year has flown by, but then again, I think it feels that way every year. I haven’t done this in a while but I couldn’t help but remember that the 1st of the month is a great time to set some new goals. Not like “lose 5 lbs this month” or “do x number of yoga sessions” type of goals. I have been looking at things a lot differently lately. My goals this month are more in the realm of mental and spiritual as opposed to physical challenges. Get at least one more room of our house “finished” – We moved into our new place back in July and sadly, the only thing that’s really done is the basement, which is because my awesome husband spent a whole day down there putting it all together. I’ve just been too busy or tired to get started anywhere else. It makes me feel better to have things in order, so I will remember that as I work on some things this month. Send out some handwritten cards – I have a couple of cards to send this month and maybe some more if I think about some people I’d like to contact. One is for a family member that is ill and another for a sweet family at my church. Bake, bake, bake – I made some oatmeal raisin and pumpkin cookies this past weekend to take to the Hootenanny and even though I didn’t have a lot of time to spend on them, they turned out great and it made me want to make some more stuff. We are having a special “Parent Sunday” at the youth cafe this week, so I will get to start on this goal sooner rather than later 😉 I also want to practice some holiday dishes I hope to make. Homemade Christmas presents – Since it’s November 1st, this means I have about a month and a half to get my Christmas presents ready. I plan to make a lot of stuff this year, I’ve already started on some knitting projects and I have some ideas for a few other things. Just need to nail these down, get the supplies and get going. Making things makes me happy! That’s about it over here! What are your goals for November? In my previous post, I mentioned that a Trader Joe’s store has finally come to Kentucky! Well, there was no way I was going on opening day or even the weekend because I knew it would be crazy busy. I went today around 4:00 and while the parking lot was crowded and there were plenty of people in the store, it was easy to get around and I didn’t have to wait in line but for a few minutes to check out. I went up and down every aisle and was there less than an hour. Score! Now for the really shocking part. How much did all of this cost me? I would have expected much more than $26!!! Granted, I only got stuff for me this time and didn’t happen to need any produce but I still can’t imagine ever spending more than $50 here in a single trip. I would bet that the same stuff above at Whole Foods or another grocery store would have run me more like $40. I was happy. A couple of things worth noting: the roasted vegetable pizza was the most expensive thing on my receipt at $4.29. The Amy’s roasted veggie pizza I usually buy which is almost identical is $6.49 and that’s at Kroger where it seems to be the cheapest. On the down side, I didn’t realize it until I got home and drank one that the Hansen’s diet soda contains Splenda. Stevia is the only “artificial” sweetener I like to use but I guess even that has some drawbacks. Still, I won’t buy those diet root beers again. 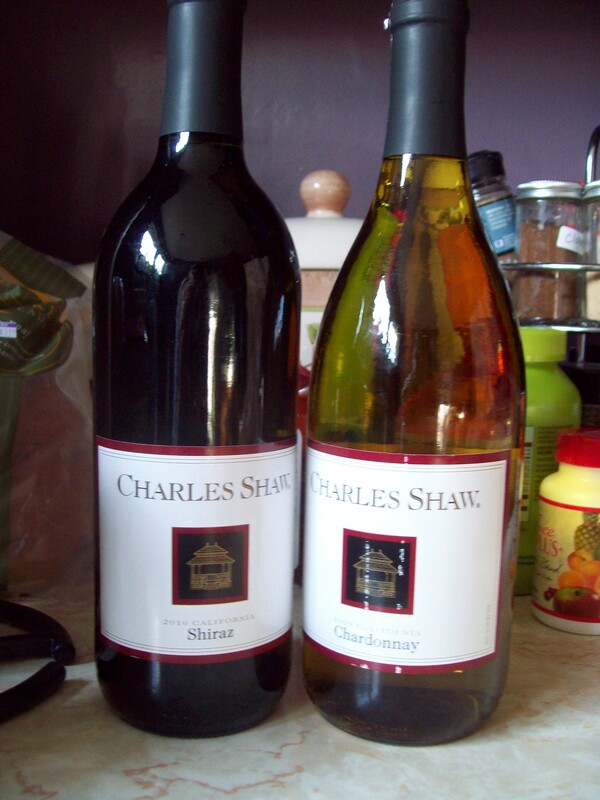 I wasn’t going to but since I was already there, I decided I might as well stop into the wine shop and see what was up. It was really small but they had a great selection, many “Available only at Trader Joe’s” wines and while they did have an expensive section, most were well under $10. I decided it was time I met this Chuck guy everyone talks about. 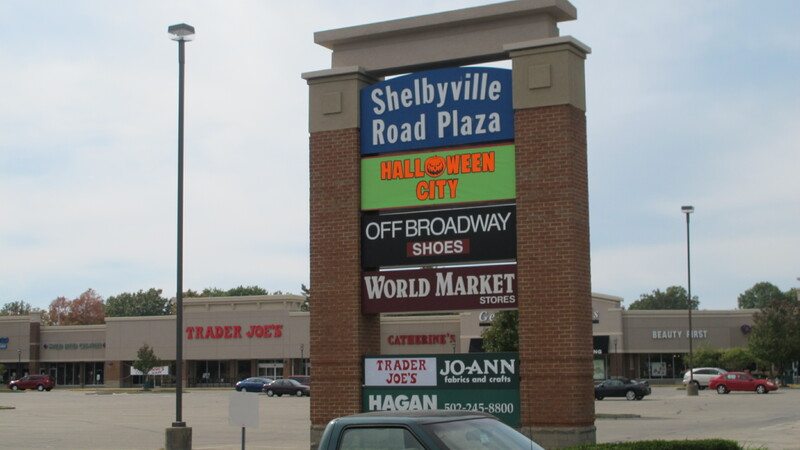 A lot of my friend’s don’t get the hype over TJ’s and think the last thing Louisville needs is another grocery store and another store on Shelbyville Road at that — the place is already known for horrific traffic at certain times of the day. Also, a few friends were turned off by the packaging of produce — many items are already placed in plastic containers or bags. I can see their point, but at the same time, having exactly 1 lb of organic grapes in a container seems like a time and cost-saver to me. I found a couple of articles about the store to be really interesting. 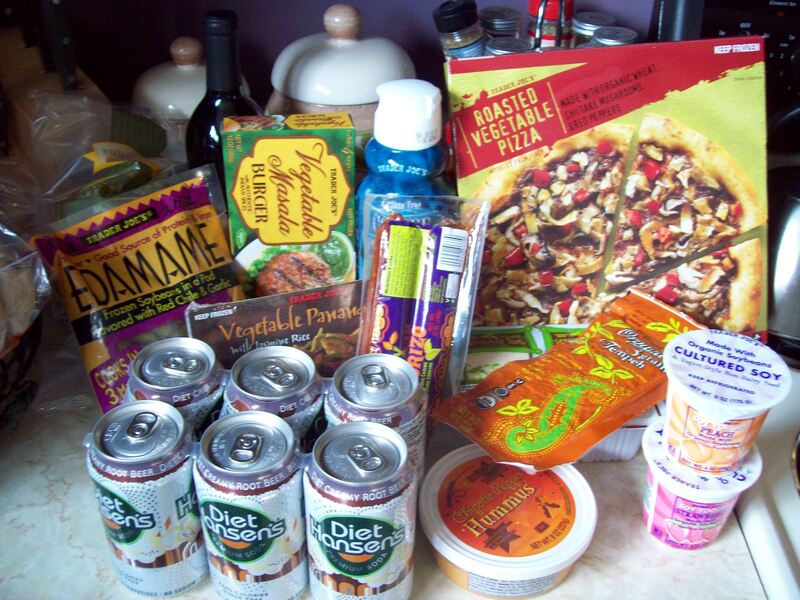 First, The Best and Worst Products at Trader Joe’s — I need to go back for the falafel and veggie burritos, definitely! Another, a local article entitled Seven Things That Make Trader Joe’s Different, pointed out some things about this store I can really appreciate. No sales, no coupons. You will always know how much everything costs and how much you would spend. I can dig that. What do you think? 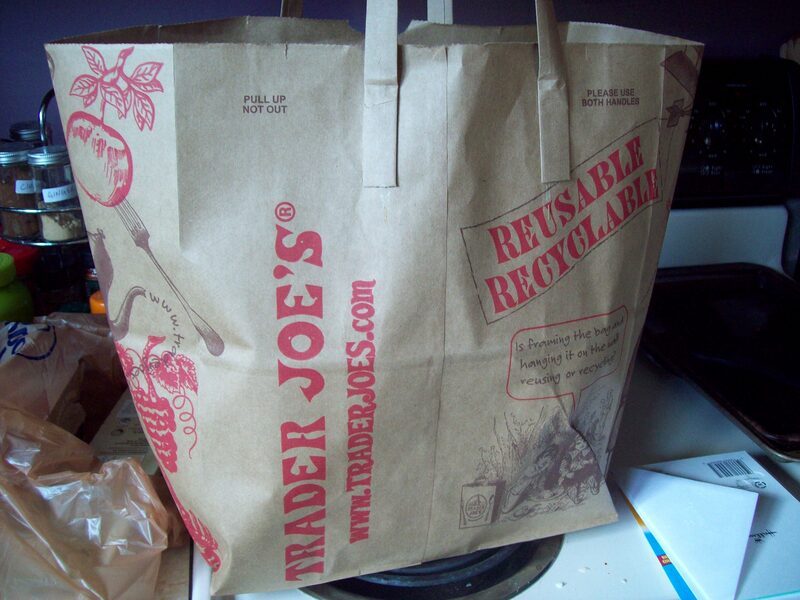 Do you have a Trader Joe’s in your area? What do you like/dislike about it? Wait, what blog is this? Who am I? Where have I been? Ha ha! This weekend there are some very exciting things going on that I felt the need to tell you about. First, today, the very first Trader Joe’s is opening in Louisville (first for Kentucky too)! Notice the teeny sign at the bottom and then check it out in the background 🙂 If you are interested in seeing what it’s like right now, check out Ashlee’s photos on or search #traderjoeslou on Twitter. Another cool thing going down this weekend is the Mighty Kindness Harvest Hootenanny at the Louisville Nature Center (across from the Zoo). 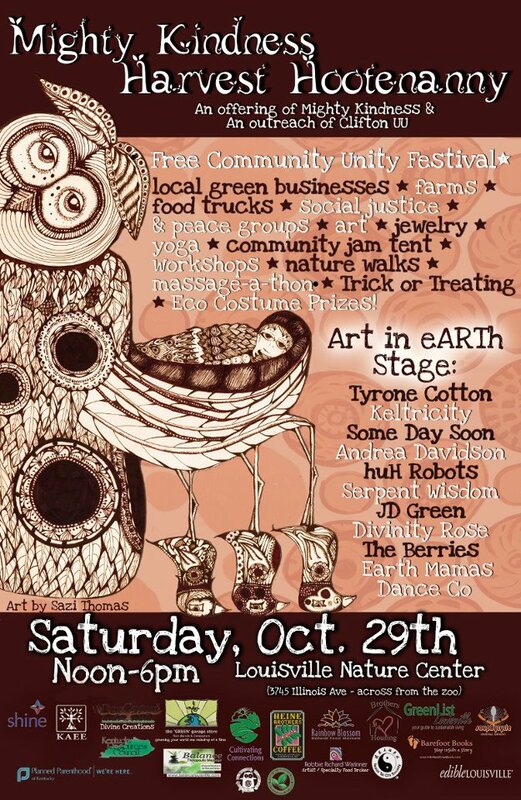 It’s a free community festival featuring all sorts of things — music, art, crafts, food, coffee, workshops, yoga, massage, etc. 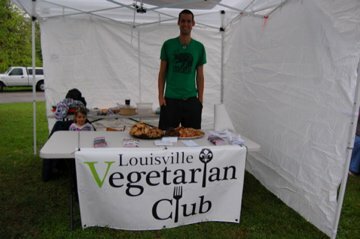 I will be there with the Louisville Vegetarian Club selling vegan baked goods and of course, promoting a plant-based diet. There will be trick-or-treating, food trucks (can’t wait to eat Morel’s again! ), and so much that there’s no way I could contain it all in this post. You will just have to come! 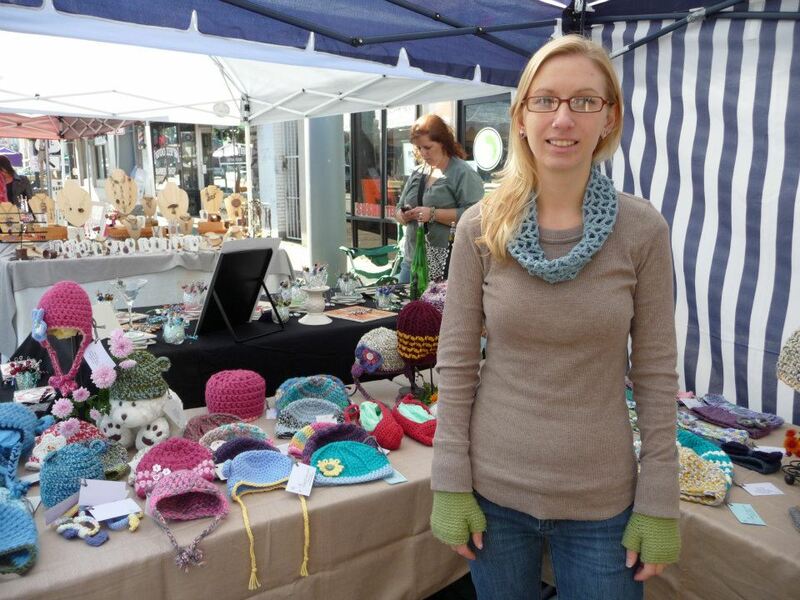 However, since I am not above a shameless plug (or two), I have to tell you my friend Kristin will be there selling her crocheted goods and jewelry at the KB&T booth 🙂 You can also check out her esty site if you can’t make it on Saturday. 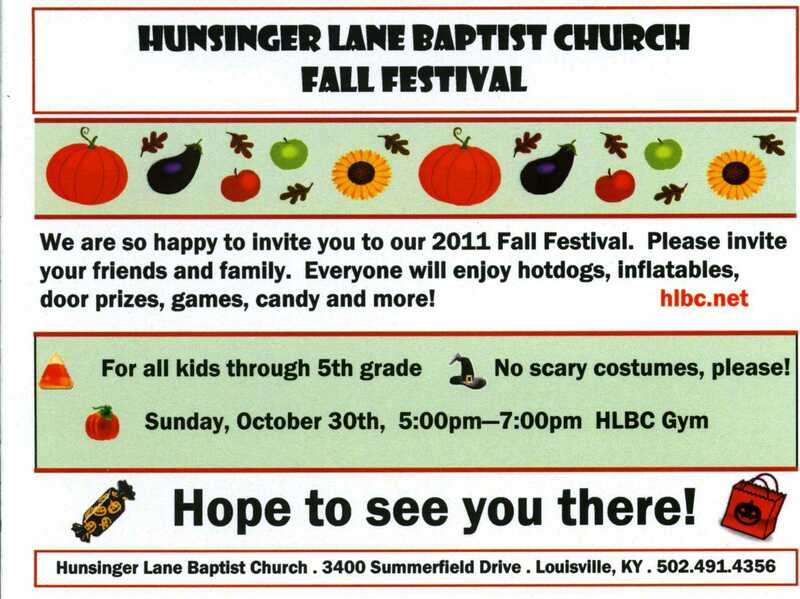 Last but not least, on Sunday from 5-7 p.m. my church, Hunsinger Lane Baptist, is having a Fall Festival! And I’m in charge! There will be a lot of stuff for kids as you can see above so if you or anyone you know has kids, bring ’em on out! We will also have adults there hanging out and socializing. I’m hoping to make a lot of new friends through this event. Everything is free! This is my first year being the director and I have learned a lot already and have a lot of ideas for next year. As you can probably guess after reading this post, I have taken a day off on Monday to recover (and make that inaugural trip to Trader Joe’s)! Have a great weekend 🙂 What are your plans? I am! I make lists for everything. 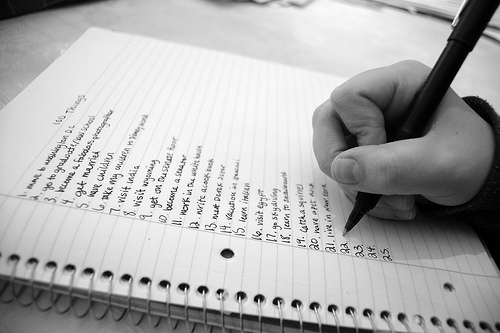 From your every day “to do” lists, chores, Christmas lists, things I want to do before I’m 30 (the days are dwindling on this one!) I am always making lists or leaving notes for myself to get things done. Do I always check everything off my list? No, absolutely not! But it is a way to help me organize my thoughts, places I want to go and to remember things that I might otherwise forget to do (this is especially relevant to chores or buying birthday cards, things I don’t do every day). But the reason I decided to post about this today is that “to do” lists in particular are causing me problems on the weekends. Now, I am able to get A LOT of things done on the weekends since I am off from work and I write down everything I want or need to do before I go home on Fridays. But I also end up absolutely exhausted, I’m talking feet hurting and everything because I do too much. Sometimes by Monday, I am so tired and sore from the weekend that getting up and going to work is almost impossible. On the weekend, I think I finally have time to do everything and go everywhere. A friend of mine even joked to me recently that all of my Foursquare check-ins were wearing HER out! When other people start to notice, then it’s really a problem! A typical weekend for me would include getting up early on Saturday morning, going to yoga, grabbing a coffee, grocery shopping, lunch, fun shopping (Target, the mall, etc. ), maybe get some gas, stop by a bookstore, oh I forgot something and have to go back to the grocery…before I know it, it’s dinner time. And I’m ready for bed. Sunday is pretty much a repeat of the same only instead of yoga and coffee, it’s church that I get up early for. And I’m usually scrambling around to get everything done at home that I neglected on Saturday while I was out and about. So this weekend, I have decided that I want to be productive but I also want to make time to rest and take a load off since I do work all week. I don’t want to wake up on Monday morning feeling like I ran a marathon. I have a lot of energy, but I don’t need to completely deplete it! What to do? Completely throw the list out? Well, no, some of my errands are going to be kind of fun. Like using the Whole Foods Living Social voucher I scored this week and I really do want to start baking with the three large cans of pumpkin that are now in my pantry. 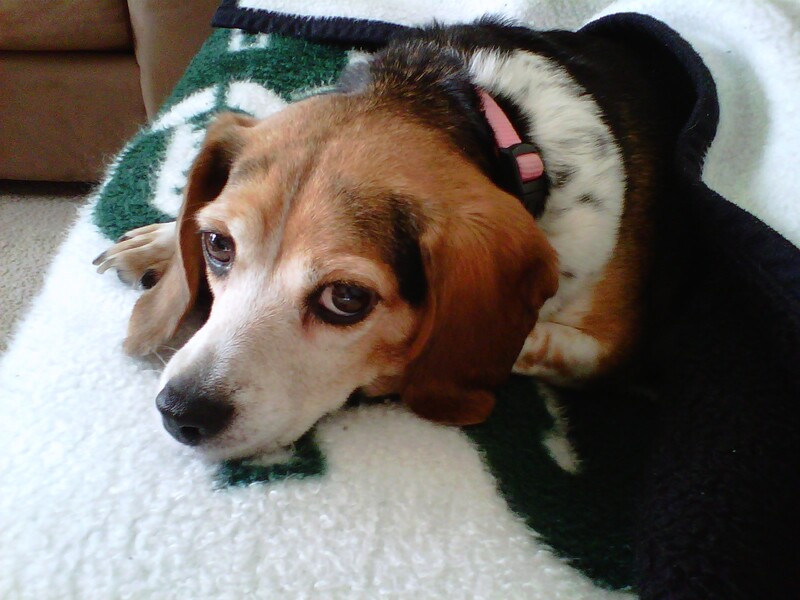 I also want to take a yoga class and take Suzie to the dog park, oh and grocery shopping…can you see how I end up here? What I need to do is set some priorities. My Google Calendar also really opened my eyes to just how busy I am, both during the week and on the weekends. It’s a good tool to use because I know where I need to be and what all I’ve got going on now and in the future, but it’s also got way too many things listed on it. I need to cut back. So this weekend, I am going to challenge myself. If nothing else gets done but those top two, then everything is okay. If I get to do one fun thing and one relaxing thing, great. If I get to do all 6 things I have listed, it would be awesome and chances are I wouldn’t be too worn out, assuming I don’t do them all on the same day, except napping, that has to happen both days! It also looks like I will spend more than a few hours of the day at home. I feel better already. Now I just have to keep it up. And not add anything to my list. What about you? Is your life over-organized and yet still full of chaos? Are you able to relax on your days off or do you go back to work feeling even more tired than you did at the end of the week?